Note: some unions fall into more than one category; chart includes non-AFL-CIO affiliates. Click graph to enlarge it. Unions and the United States Labor movement have continued their historic decline in terms of membership and density, under a Democratic president and in a booming economy. Unions have emerged from a period of economic growth and prosperity not larger and stronger but weaker and smaller. Having missed an incredible opportunity to grow in a time of prosperity, labor must now figure out how to build numbers and strength in face of economic uncertainty, a Republican President, war, budget deficits, public service cuts and the continued exporting of union manufacturing jobs. The unions of the United States have huge resources: 15 million members, billions of dollars in dues, and hundreds of billions in pension capital, as well as political power and the leverage of collective bargaining. 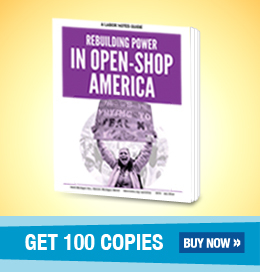 These resources offer the potential and the opportunity to organize millions of workers and rebuild the labor movement. Labor can't and won't rise to this challenge, however, without an honest analysis of why unions continue to fail to organize, build and exercise power. For too long we have avoided that honest analysis, in an unspoken agreement to avoid difficult questions that expose disagreements in strategy and beliefs. There is little discussion or acknowledgement that most unions lack the resources, focus or size to grow. Even under the best of circumstances many unions can not develop the capacity for large scale organizing. The labor movement is "united" around diplomatically written resolutions that attempt to satisfy everyone. The problem is that this paper unity doesn’t make unions stronger. It weakens them by masking fundamental problems that are at the root of our failure to organize, grow and win. We have not always been so reluctant to debate the issues of how best to unite workers and increase their strength in the workplace, their industry, their communities and the country. The Knights of Labor died and the AFL was born. The CIO split from the AFL and organized manufacturing. After tremendous growth of both the AFL and the CIO, they decided to merge and create one labor federation. Unions have restructured and reorganized themselves and their labor federations throughout their history, as changes in the organization of the economy, corporations and work demanded changes by unions to address the new economic and political realities. Union growth, in both numbers and density, has not come from slow and steady progress. It has come in dramatic “spurts” (Freeman, Spurts in Union Growth, 1997) tied to changes in the economy, larger social movements, and political change in the country. Actions and decisions that workers and unions have made at these times has had a profound impact on labor’s success and defined what the labor movement became in the years after these breakthroughs. Labor's crisis is worsening: The crisis facing labor can't and won't be addressed by doing more of the same. The continuing decline of union density, in almost every sector of the economy, threatens the ability of unions to play a meaningful role in society. Individual unions, no matter how successful in the short run, can't survive in the long run unless the labor movement as a whole starts to grow and win. The Private Sector must be organized for all workers to win: Labor's survival will be decided by our ability to successfully organize in the private sector. Public-sector growth has masked the depth of our decline while continued shrinkage in the private sector creates the economic incentive and political space to slash public services and attack the standards of public sector workers. Organizing millions of private sector workers in the face of vicious employer opposition, at a time of incredible corporate wealth and power, is the central challenge for the labor movement. Failure to understand both the magnitude and importance of this challenge destines unions to failure and growing irrelevance. We must focus on uniting and strengthening workers- not protecting institutions or leaders: Labor needs a new set of principles that lead and strengthen the labor movement based on what is best for organizing, uniting and strengthening workers, not protecting particular institutions or leaders. The resources put into assuring institutional survival are diverted from the effort to build power for workers. a) How does labor best organize and structure itself to make large scale organizing and bargaining possible? b) If unions were to succeed in doubling or tripling membership, what would be different beyond having more members? How would the labor movement operate differently and more effectively? How would workers be stronger within their industries, in their communities, the United States and world economy? You can’t answer the first question without answering the second. Until we have a vision of what a successful labor movement should look like, unions are trapped in a futile effort to reform and reshape something that is broken. The current structure of the labor movement stands in the way of organizing workers and building increased strength for workers at every level of the labor movement. We must consolidate into large sectoral/industry unions that have the resources and focus to unite millions of workers: A precondition for successfully organizing and uniting millions of new workers in unions is a consolidation, rationalization and reorganization of the labor movement. It is a natural instinct for union leaders to diversify their union’s membership into numerous industries where they believe there is the greatest chance of success with the least risk. This is an attempt to gather enough members to help their institution survive, but doesn’t help build strength for workers or organize large numbers of workers. Labor needs to evolve from 66 amalgamated international unions with multiple overlapping jurisdictions into a small number of large sectoral unions with the resources, focus, capacity and self-interest to grow and win for workers in their sectors. These unions, in turn, need to unite in a labor federation where they can develop strategies to organize and build power while holding each other accountable to implementing these strategies. II. Where is the Labor Movement in relation to the economy? There are unending statistics that document that the labor movement is in crisis and faces potential extinction. Pointing to labor's density of 13.9% of the overall work force doesn't capture the true depths or causes of labor's declining power. Understanding the structure of the economy and comparing this to how unions are organized is critical to developing any analysis of why unions are failing and developing a strategy for unions to organize and rebuild the labor movement. The US economy is divided into 15 sectors with over 100 million total workers. Sectors range in size from 460 thousand in mining to 19 million in retail. Union density ranges from a high of 35% in education to a low of 2.7% in finance and insurance. The AFL-CIO has documented that the US economy is growing away from the labor movement, growing fastest where unions are weakest: only one out of ten new jobs is union. Private sector unions are losing density in the traditional unionized sectors of the economy. Labor’s weakness is glaringly evident in the low density figures in most sectors. We can see in those same numbers the potential for huge growth, with millions of non-union workers in every sector but mining. Unions represent 13.9% of total work force. Unions represents 9% of the private sector. In 13 sectors of the economy union density continues to decline. The enormous and difficult task ahead for labor- organizing tens of millions of workers- is magnified by the fact that most unions are quite small in relation to the numbers of non-union workers in their primary jurisdiction. There are ten million non-union workers in manufacturing alone. Furthermore, increasingly unions are multi-jurisdictional, attempting to represent workers in different and unrelated sectors of the economy. The overwhelming majority of union membership within the AFL-CIO is now concentrated among 15 unions. In 1979, there were 108 AFL-CIO affiliates; there are now 66, with a total of 13 million members. Unions face a choice between two starkly different directions. One is an accelerating trend towards consolidation of union membership into 10-15 multi-jurisdictional amalgamated international unions, which represent the vast majority of AFL-CIO members and are not focused on dominating specific industries, labor markets and sectors of the economy. The other is for unions to consolidate into 10-15 unions with each focused on specific sector(s), industries and labor markets. Union membership: Average 2001 membership of AFL-CIO affiliates. Organizing in the private sector is becoming more difficult at the same time it is becoming more important. Union density and strength is down and employer resistance to organizing is up. As unions become weaker and density shrinks, employers have both more "rational" business reasons to oppose unionization (it makes them less competitive in the market place) and a greater ability to defeat union organizing efforts. Increasingly, unions face a catch 22. They are in the position of losing members and market share if they force standards up for the ever-shrinking percentage of unionized employers. If, in an attempt to protect current members and unionized employers, a union accepts lower standards they lessen the reason for workers to want to organize, join or support the union. Unless unions dramatically increase density in key sectors of the economy, there will be no significant economic advantage to being a union member or working under a union contract. If union membership brings no real economic advantage why would workers risk their jobs to win a union at work? Density, the percentage of the total workforce, sector of the economy, industry or labor market that is unionized, is critical to labor’s ability not just to bargain effectively but also to organize on scale in the private sector. There are four different ways to think about density that are useful in gauging the current strength of unions and identifying where there are the best opportunities to increase the strength of workers and their unions. Workforce Density doesn't show the fact that some sectors of the economy may have much higher density rates. For example overall workforce density is 13.9% while in construction it is over 20%. Sector Density: The percentage of unionization in each economic sector indicates more specific areas of membership concentration. Sectors are so broad, however, that unionization may be low for an entire sector but significantly higher for industries within it. For example, density in durable manufacturing is 16.4% while density in the automobile industry is 37%. Industry Density: Within industries employers often compete in geographically defined labor markets. Density may be low in an overall industry but higher in specific labor markets. For example there is 10% density for janitors nationally but in the New York City labor market density is 90%. Labor Markets: Labor markets are the places where unions have the best ability to affect density. In a concentrated defined labor market there is greater opportunity for unions to utilize their existing membership base, and the strength of the labor movement in the community and politics to support an organizing campaign. While significant union density is a precondition for raising standards in an industry or labor market it is not a guarantee. High union density only helps if all unions and locals in the industry or labor market are working together and speaking with one voice. If unions can’t hold each other accountable, then the decision of one union to go it alone, and negotiate lower standards undercut the ability to raise standards for everyone. Increasing union density is important for three interrelated reasons. a) High union density increases a union's ability to raise standards: Density directly affects the ability to negotiate and improve industry standards. The higher the percentage of an industry or labor market that is unionized, the greater the ability to take wages out of competition and raise standards. Without high density unions can't accomplish their core mission of improving standards for workers. Since union wages and benefits won’t make them noncompetitive, non-union employers have less "rational" business reasons to resist unionization if their competitors are unionized. Unions have more power and resources to dedicate to organizing when they have higher density. Workers have more reasons to organize, if organizing gives them a real expectation of improving standards. Unionized workers serve as example for their non-unionized counterparts. A worker whose friends all belong to a union is more likely to view unionization as the norm rather than as an exception. In short, limited employer resistance coupled with workers who know unionization equals higher standards make organizing easier. It is difficult to reach "critical mass" in a time of decline. It is even harder because the majority of AFL-CIO affiliates, in the private sector, are less and less focused on increasing their density (power). And it is near impossible when the labor movement’s structure is a roadblock to increasing density. This brings us to the seeming paradox of a labor movement that increasingly endorses organizing but still doesn't organize. After years of debate about the importance of organizing, almost the entire labor movement salutes the flag of organizing. There is now consensus on the centrality of organizing to labor’s mission and survival. Organizing won the debate-everybody agrees unions need to organize. The only problem is that unions aren't organizing. Despite the rhetoric that rings through nearly every union convention, the labor movement, especially in the private sector, isn't growing, isn't organizing on scale and isn't winning. In the 1990s, unions won elections for an average of 90,000 private sector workers per year, compared to 250,000 to 350,000 private sector workers in the 1960s. Today we have more support for organizing and less organizing. Average Number of Workers Organized Annually in NLRB Elections. Much of the labor movement believes that the continued failure to organize and grow is due to unions not trying hard enough. So enormous amounts of time and energy are spent in the effort to inspire and educate unions into organizing. The operating assumption is that if union members and leaders are educated to understand the nature of labor's crisis, and inspired to believe they can win, they would have the will to make the internal changes in their institutions that make organizing possible. Clearly every level of the labor movement needs to understand the crisis and believe unions can win. But that is not enough, as we have learned in the last 20 years of organizing experience. Education, inspiration and will cannot overcome the obstacles created by the way unions and their locals are currently organized and structured. Continuing to hide behind this rhetoric is dangerous, because it prevents us from confronting the politically explosive and emotional issues of the failure of most unions to organize or protect their own industries, even while they organize in industries where they have no density or strength. The fact is that the decline of many AFL-CIO affiliates is so deep and severe that they do not have the resources or strength to challenge powerful employers on a large scale. They don't have the internal resources or capacity, no matter how they "change to organize," to win enough victories or to increase density and move towards the "critical mass" that sets the stage for real growth in a labor market or industry. It goes against the grain of what organizers have dedicated themselves to for years to admit that many unions can't and won't organize. It is terrifying for those who have spent much of their lives trying to convince unions and the labor movement to organize to acknowledge that that the emperor has no clothes. But, by every objective measure the majority of unions and their locals aren't organizing successfully and there is no evidence that that they can or will. Acknowledging that many unions can't and won't organize forces us to ask difficult questions about the systemic internal structural obstacles to organizing. Instead of saying all it takes is everyone trying harder, we need to ask hard questions that force people to address the bigger issue that face us and demand unions make hard choices. Exploring the decline in labor's power in the period since the AFL and CIO merger helps to explain how the problem goes far deeper than a lack of will and desire to organize. It illustrates that decline in density in labor market after labor market and the abandonment of maintaining and increasing density in specific sectors/ industries and labor markets is both at the core of labor’s decline and central to labor’s rebirth. In 1955 when the AFL and CIO merged labor was at the peak of its power. Nearly a third of the workforce was organized, almost all in the private sector. Over the next quarter-century, total membership grew from 16 million to almost 21 million. Yet, at the same time density dropped from 32% to 23%. Source: Freeman (1930-1982), BNA Union Membership and Earnings Data Book (1983-2001). The roots of labor’s paradox lie in 24 years of a growing membership and declining power (density). Unions thought they were growing stronger when in fact they were growing weaker. The cliché that unions chose not to organize does not withstand further scrutiny; in fact, unions organized 350,000 private sector workers in 1968, almost four times the average number of workers organized annually during the 1990s. But even as unions grew, they abandoned the fundamental principle that workers’ strength comes from the ability to control wages by dominating their industries and labor markets. We believed we could maintain standards with our existing power, even as we lost market share. Ironically, union density and political power allowed unions to organize workers and industries unrelated to their historic jurisdiction and base. On the surface this would seem like a good thing. But it allowed unions to avoid the job of expanding in their industries in difficult organizing environments like the South. Private sector unions could grow and add members even as density began to drop in their core jurisdictions. Union expansion into the public sector further masked the escalating decline in private sector density. Unions made the mistake of substituting building power by industry and labor markets for the false power tied to unconnected numerical growth. Unions looked like they were growing stronger when in fact they were growing weaker. Union density and membership have gone through 3 distinct phases over the last 70 years. 1934-1954-Density and membership increase. From 1934 to 1954 density grew from under 12% to 33% while membership grew from 3 million to 16 million. From the period of 1947-1954, real wages for production workers rose an average of 3.0% per year. 1954-1979 Density declines and membership increases From 1954 to 1979 density went down from 33% to 23% while membership went up 16 million to almost 21 million. During this period real wages for production workers rose an average of 1.4% per year. 1979-2002 Density and membership decline: From 1979 to today density has declined from 23% to 13% while membership has declined to 15 million total union members and 13 million in the AFL-CIO. Private sector membership has declined to 9% and 9.1 million total. During this time the income disparity between rich and poor increased dramatically: the combined wealth of the top 1% of U.S. families is now greater than that of the bottom 95%. It is clear that declining density ultimately undermines the ability of unions to organize, bargain, and win for members. Even increasing total union membership without increasing density in specific sectors of the economy offers only the illusion of power. When both density and membership decline, labor faces a massive loss of power at the very time that hyper-competition and the global economy are driving labor standards and union membership down throughout the world. What's going on in the economy and what does it mean for workers? The U.S. and world economy continue to go through a massive restructuring that consolidates corporate wealth and power. This plays out domestically in two important ways. On the one hand there are giant entities with hundreds of thousands of employees (Walmart), whose sheer size allows them to set labor standards in their sectors and labor markets. On the other hand huge numbers of "small businesses" have sprung up to handle the subcontracting and outsourcing of the larger corporations which ultimately control wages and benefits provided by the subcontractors. The large corporations threaten union standards and jobs, but it is hard to imagine how existing unions can organize them. The relentless competitive pressures forced on the small companies drive wages down and make it impossible for these subcontractors to survive as unionized companies unless unions also organize their competitors and raise standards throughout the industry. In both cases--the growth of giant industry-dominant corporations and industries marked by massive subcontracting--changes in the economy make organizing much more difficult for workers and unions. The size of employers, the number of workers that need to be involved and the complexity of how subcontracted-outsourced industries work make winning harder. While changes in the economy reinforce the need for unions that organize and dominate sectors, industries and labor markets, unions continue to move in the opposite direction, becoming amalgamated general workers unions. The globalization of the world economy threatens certain segments of the US economy, especially in manufacturing, with international competition that drives down wages and shifts production abroad. In the long run, this can only be addressed by increasing density and strengthening the labor movement internationally. In the short term, the diversity and sheer size of the US economy allows unions to target segments where competition is primarily driven by domestic and local labor markets. This is true in the service sector and niches of manufacturing that are tied to specific geographies. Labor’s history includes numerous debates such as those between craft unionism and industrial unionism or social unionism and business unionism. The response to our present decline has seen unions sliding into General Worker Unionism and its weaker cousin Corner Store Unionism, which has profound implications for unions’ ability to organize, win for workers and play a real role in reshaping and transforming society. This trend is playing out at both the national level and the local level. Craft unionists and industrial unionists both believed that they needed to dominate their craft or industry to have the strength to protect and improve standards for their members. Business unionists and social unionists disagreed on issues of unions' role and mission in society. But they both took it as given that part of unions’ "business" or "social mission" was to stop workers in the same industries or labor markets from competing to work for the lowest wages. In other words, a successful union of any description must build and exercise power for all workers in an industry or craft in order to raise living standards for its members. Today the question of standards in relation to other workers doing similar work is dropping out of the picture, as unions dilute their industry strength by organizing haphazardly in a misguided effort to survive. Non-strategic Mergers: There has been a series of non-strategic mergers that has served two purposes: providing a home and jobs for the union too small to survive, and stabilizing or increasing the membership of a larger union. These mergers have not been based on increasing the ability of the combined union to organize and bargain to increase their strength in their industry. Non-strategic organizing is equally prevalent. Most unions’ organizing programs are based on organizing low hanging fruit (seemingly easy targets) and exploiting hot shops (where a group of workers are angry and seem organizable), even if they are unrelated to the union’s core industry. Trying to gain members to make up for losses--a little public sector, a little health care, a few airlines, a little manufacturing-- these unions are becoming general workers unions to stabilize their membership. The price they pay is to be “jack of all trades and master of none,” attempting to beat employers and change conditions in a multitude of industries where they only represent a small percentage of the workers. General Worker unionism allows a union to mask its growing weakness in its core industry(s) by adding in members from all different industries. While some unions morph into general worker unions at a national level, many of their locals and some smaller international unions are turning into small business unions/corner store unions. Their primary reason to exist is to keep on existing and to provide employment for officers and staff. It doesn't matter what kind of workers they represent or their ability to improve standards for these workers. Success is measured by gaining enough members to stay even or at least slow the rate of decline. They are different from traditional "business unions" in the sense that growth and being a larger, more successful business isn't of their plan. These are miniature general workers unions, too small to even pretend they have power. They are generalists with a little bit of knowledge about a lot of products and no resources. They don't control a market, they can't drive prices, they can't significantly change conditions, and they don't have political power. They provide employment for a small number of people (often family members), but they have no real power or ability to change, influence, and improve conditions in society. And if they become so small that they can't survive any longer (pay the bills) they sell (merge) to the highest bidder. It is absurd to think in this time of weakness that a union can win for workers in many industries at once. It flies in the face of labor's experience of what it takes to organize, win and increase density. In addition it is a misuse of labor's limited resources to have numerous unions attempting to organize and bargain in the same industries at the same time. The drift towards general workers unionism and its weak cousin corner store unionism undermines every level of the labor movement. It fundamentally changes the basis on which unions define their success. In a movement of general workers unions and corner store unions, unions don't have to organize and dominate labor markets to succeed. The definition of success has been perverted to equal the continuation of institutions, not building power and winning for workers. Decisions and choices that are made now will write the next chapters of labor's history. Without making conscious choices of what labor should do, bad decisions will be made by doing nothing or more of the same. Part of the problem is that most analysis and prescriptions for change begin with the assumption that there are a series of things the AFL-CIO and individual unions can and should do within the confines of the existing structure that will lead to organizing and growth. The question of whether or not the existing structures are central to labor’s decline hasn't been addressed and as a result unions are trapped in a paradox, one that narrows labors vision and blinds it to the potential to improve jobs, communities and this country. A first step in building a new labor movement requires uniting workers and unions around a vision of what an effective labor movement can do to transform workers’ jobs, their lives, and this country. A vision that inspires people by asking them to imagine a country where a strong labor movement could match the power of global corporations, where everyone has health insurance and a living wage. A vision that captures how life in this country would be different if workers and unions had real power in their work place, in the 15 sectors of the economy that employ over 100 million workers, in their communities, in their states and nationally. The next step is figuring out the best way to organize and structure the labor movement to maximize workers’ strength. If we could start from scratch, and weren't handcuffed by history, tradition and protecting individual leaders domains, would we create a labor movement that is structured like this one? The labor movement needs to imagine how it could operate differently, and what it could accomplish if it structured itself to increase the ability of workers to organize and bargaining together. If you believe, in the long run, that workers would be stronger if they were united in large unions that dominate their sector and industry then it is critical to address the issue of how unions organize and structure themselves now. There are times where a confluence of forces come together and create conditions in society that dramatically increase the hand that workers and unions have to play that make it possible to win on a grand scale. We don't currently live in such a time, nor do we have the luxury of waiting for one and doing nothing. What unions do before, during, and after a spurt in growth makes an enormous difference in their ability to maintain and increase density. The higher the density is when unions enter a time of explosive growth (spurt), the higher it will be at the end of the spurt. It is not surprising that countries that entered the 1930's with higher density than the US also ended this spurt with higher density than the US and have maintained it for over 70 years. Because it is so hard to win outside of a broad national and world-wide spurt of growth we have to be very clear on what the preconditions for winning in the current environment are. While we can't create a spurt or movement out of sheer will, we can take very concrete steps to win strategic victories now. Winning demonstrates to workers that by organizing unions in strategic geographies and critical parts of the economy they can dramatically improve standards, and this gives them a reason to organize. Unions have demonstrated that they can win, even against fierce opposition-when they organize smarter. When a union picks a target instead of letting the target pick the union, workers are more likely to win. When unions organize off a base of strength they are more likely to win. When a union has a sophisticated approach to organizing based on an analysis of the targeted industry and what kinds of leverage it will take to win, they can defeat powerful employers. Effective organizing campaigns need to be industry driven and market-wide. By focusing workers on changing conditions in an industry, not just fighting their individual employer, unions start to create the conditions that allow unions to win. No matter how smart we are, small campaigns add up to little. Unions need to think and act bigger. Pension Power: Billions in union pension power holding corporations in which workers have investments accountable for their behavior. To organize whole industries/sectors/labor markets requires a massive multi-year investment of human, institutional and monetary resources. Unless unions can amass and focus these resources they can't and won't win. The best plans and strategies can't be developed and implemented unless resources are available that mirror the size of the mission. To win big, unions need to think big, be big, and back up a big vision with big resources. Investing resources in campaigns of huge size and scale is a critical ingredient in strengthening the power of workers during a time of historic decline. Industry/labor markets matter: There are fascinating and complicated stories each time workers and their unions have succeeded in breaking open a new industry. For each winning campaign there are different factors that led to success. But there is simple and common sense thread that ties together great historic industry organizing breakthroughs: a union decided that their mission, their reason to exist, and their very survival was based on organizing a sector/industry/labor market. When Carpenters organized, when garment workers organized, when auto and steel organized, they focused all their resources and future on winning their industry. There was only one definition of success-organizing the targeted industry. Industry breakthroughs haven't resulted from a union dabbling part time in organizing an industry. Movement building-where geography and industry meet: Industry wide campaigns may be driven by a national strategy, but they need to be implemented on the ground through focused geographic activity. In some sectors of the economy labor markets (the group of employers competing with each other) are national and international, e.g. manufacturing. In others, labor markets are regional, e.g. construction, retail. No matter how the competitive labor market is organized, to build excitement and energy among workers, and to mobilize community support, there needs to be geographic concentration. Strong local unions committed to organizing and structured along industry lines are essential. Uniting and winning the support of other unions and allies is critical. Workers are organized, and movements built at work sites and the community where workers live. Campaigns that focus just on geography and ignore industry won’t be able to effect economics and fall into the trap gaining numbers and not power. And ultimately workers can't build power and win if they don't see the union as the primary vehicle to change their lives at the workplace, in their communities and in the country. Union membership was distributed more evenly in the country and was expanding into non-union areas like the south, and unions were increasing density in currently non-union sectors of the economy. Industry-The group of competing employers that control labor standards and jobs. Political and community life-The place workers live and the various levels of government that play a critical role both in controlling employer behavior and winning economic and social justice in the country. It is too narrow to talk of union democracy only -the question of how a union is governed- we need to talk more broadly about how unions are strong enough locally and nationally to win economic justice and democracy for workers. If only 10% of workers in an industry are unionized it is impossible to have real union democracy because 90% of the workers are excluded. If unions are weak there is no democracy at the work site. If unions don't dominate industries, there is no power to challenge the dictatorial power of corporations. If unions don't represent a significant percent of the workforce workers won't have political power in our communities or nationally. Union democracy, real power and democratic rights for workers in society are all intertwined in a struggle to build power for workers at every level of work, the country and the global economy. It is through direct relationships with unions at the work-site that workers live and experience the ways that collective power can make a difference in how they are treated. It is through raising standards in an industry that workers learn that by uniting with workers employed by other companies they gain greater power. And it is through uniting with allies in our communities and nationally that workers can improve their communities, elect and influence political leaders. Leaders matter: Many times unions have grabbed defeat from the jaws of victory. Big, smart, strategic campaigns, with massive worker support can by lost by leaders who lack the courage and vision to support them. In the end leadership does matter. Good leadership alone isn't enough to win, but lack of leadership can sabotage and destroy the best organizing campaigns and unions. While some unions are making progress, the labor movement overall is not. Even if a couple of unions grow, they can't overcome the tide of deunionization that is sweeping the country alone. It is essential that the labor movement as a whole increase in size and strength. In theory it is the AFL-CIO that should lead and drive change and revival in the labor movement. The fact that the AFL-CIO has little power to compel affiliate behavior and drive a reorganization of the labor movement is the critical issue before labor. In frustration and anger it is natural to want an enemy, someone to blame for all of labor's problems. For many it has become the AFL-CIO. It is easier to blame the AFL-CIO then take responsibility for problems or weaknesses of our own unions. The problem isn't a shortage of good ideas at the Federation level, it is the inability to implement these good ideas in the face of affiliate disinterest and/or opposition. Yes, it is the AFL-CIO that should resolve jurisdiction problems, encourage rational mergers, focus on industries, geographic concentration etc. The reality, however, is that the AFL-CIO has no constitutional authority to compel affiliate behavior. It can kick affiliates out, affiliates can quit, but by culture, history and constitution the AFL-CIO is forced to operate by consensus. No matter how great and inspiring the leaders, they are forced into a constant balancing act to try to keep affiliates small and large happy. At a time when we need dramatic and fundamental change it has proved impossible to even get agreement on something as simple as strategic registrations of organizing targets, where unions would agree not to organize an industry where one union or group of unions are committing significant resources. If we can’t agree that unions shouldn’t interfere with other unions’ organizing efforts, how can we expect to reach agreement on how we should realign membership? The AFL-CIO has a series of affiliate bodies at the national and local level designed to coordinate the activities of its affiliates. Trade departments, constitutional committees, state and local labor councils are all ham strung by the same problem. They have no authority to hold anyone accountable. Unions negotiate agency shop and require workers to pay dues, but we have organized the AFL-CIO on the principles of the Right to Work Committee. In the name of autonomy affiliates are allowed to refuse to be held accountable for the impact of their actions or inaction on the conditions and standards for workers. Keeping everybody "in" and remaining "unified" naturally pulls everything to the status quo and against change. The job of trying to win consensus among 66 affiliate unions at a national level is near impossible. This is magnified at each level of the labor movement since most unions have multiple "autonomous" locals in each city and state. The abandonment of industry focus and jurisdiction has led many unions to view attempts at rationalizing organizing through a prism of how such actions will limit their ability to survive. The AFL-CIO is a creature of its affiliates. It isn't the AFL-CIO's fault that unions aren't organizing. It can only act with the support of its affiliates. As unions devolve into general workers unions and shrink into small businesses the AFL-CIO has less and less ability to unite and lead the labor movement around a program of organizing and change. If every union does a little of everything then labor is moving towards a series of small federations (mini AFL-CIO's) within the AFL-CIO. The 15 largest unions who have over 10 of the AFL-CIO's 13 million members can maintain their existing membership and even grow through a combination of merging in smaller unions as they continue to decline and organizing low hanging fruit and hot shops. Many unions can organize a couple big public sector units, do a few mergers and say "we are winning, we are growing." One of the answers to labor's paradox lies with the nexus of individual and institutional self-interest and a movement that defines success by numbers, not by building strength within industries and winning for workers. Unions can be individually and institutionally "successful" while the labor movement and workers become weaker. The structure of the labor movement- loosely confederated, overlapping amalgamated unions- undercuts creating conditions where leaders’ and unions’ success are defined by organizing to dominate industries, organizing new industries and increasing the percentage of the private sector represented by unions within industries and over all. There is no incentive to do the hard and risky work of organizing and beating big and strategic industries and employers because there is no restriction on each union taking the easiest route to stabilizing themselves. The goal of organizing becomes perpetuating a union(s) as an institution-not developing a plan and strategy to win for workers by reorganizing sectors we've lost and organizing new sectors of the economy. The labor movement is broken at every level from the AFL-CIO to international unions, to local unions and the various bodies that attempt to unite unions at the local level. The labor movement as it is currently constructed is incapable of rising to the challenges it faces. Labor’s goal must be to organize millions of private sector workers and continue to grow in the public sector. This requires huge investments of resources and industry focus. 76% of the AFL-CIO's total membership is already concentrated in 15 unions. Over time, as smaller unions decline or merge, this concentration of union membership into a handful of unions will continue. Based on decisions and choices people make, the labor movement faces two radically different futures. A labor movement made up of 12-15 General Workers Unions or a labor movement made up of 12-15 industry/sector based unions. The choice is between growth and power or managing labor's decline into irrelevance. VI) What is to be done? Some argue that we must continue to try to reform the AFL-CIO and the entire labor movement. Others argue for focusing on working together on a local level or for leaving the AFL-CIO (Carpenters) and going it alone. There is a middle ground that avoids the distraction and conflict of attempting to operate outside of the AFL-CIO without being trapped and slowed down by it. The starting point is to get started and not wait for consensus from the entire labor movement. When we organize a group of non-union workers we tell them the first step to winning a union is to start working together and acting like a union. A group of organizing unions need to start acting like a labor movement by adopting, enacting and embracing, a set principles that guide their actions in the short run and demonstrate how the labor movement should operate in the long run. Labor needs a concrete action plan that stands in stark contrast to the romanticizing of the 1950’s by the right, the numbing consensus building of the center and the generic rhetoric of the left. Labor needs to realign, start merging, consolidating, and exchanging members. This needs to be done at a national, state and local level. In developing a new road map for labor there is a simple test-how should unions structure and organize themselves to best unite and build strength for workers? It is clear that it weakens construction workers to have 15 construction unions. Manufacturing workers would be stronger if they had one, two or three unions in manufacturing instead of 14. Transportation workers would be stronger if they didn't have 15 different unions in their sector. Public sector workers and health care workers would all be stronger if their strength wasn't divided between dozens of unions. Workers in currently unorganized jurisdictions will be stronger if one union dedicates itself to organizing them then if multiple unions dabble in organizing them. Instead of trying to convince unions of this, we need to prove it through our actions. One united movement. We must operate as one united movement of working people. At the local, state, and national levels, we must develop joint strategies, pool resources, strengthen worker participation and community alliances, and be accountable to each other for carrying out the decisions we reach. We can no longer afford to go it alone, work at cross purposes, or duplicate efforts. 21st century strategies and structures. We need strategies and decision-making structures that match today's employers and their political allies. While the powerful forces we face coordinate strategy at regional, national, and international levels, workers often find themselves unable to respond effectively because of weak, splintered, and underfunded structures that were designed decades ago in a very different world. Inspiring working people to action. We need large-scale campaigns that address more fundamental problems and project a larger vision than the small incremental goals we typically work toward. Doubling the number of workers who are united with us. We must agree on specific strategies to double the number of workers united in our movement over the next decade and to do so in a way that unites rather than divides the strength of everyone who does the same kind of work. Imagine how different our country would be if for every union member today another one were added, giving us twice the strength in dealing with employers and public officials. Without making this our top priority as one united movement, working people will continue to be on the defensive and fall behind. While organizing around principles of a new labor movement we need to get started by working with unions that are committed to organizing their industries to win power. A group of organizing unions within the AFL-CIO need to agree to a set of principles and binding rules that guide their actions at the national and local level. These unions need to take dramatic steps to demonstrate the potential of a labor movement guided by a new set of principles. While some of these ideas are not new, the speed and success of implementation will be greater without the burden of trying to win the support of all unions to move ahead. Realigning to build worker strength: Transferring and exchanging members/bargaining units to support industry organizing and bargaining strategies. Advocating and initiating strategic mergers: A concrete proposal should be developed that outlines how a series of strategic mergers between unions that share common industries would strengthen workers’ ability to organize and bargain in specific sectors of the economy and increase the strength of labor overall. This proposal would be an outline of what a labor movement consolidated along sector lines would look like. Working together and pooling resources: There are a series of opportunities where coordination and increased resources could help to win important victories. a) Geographic concentration: Increase the resources dedicated to organizing multiple industries in the same areas. Select a series of states/cities to simultaneously run large scale organizing campaigns with major political/community initiatives designed to create an environment that supports organizing. b) Organizing and bargaining: Agree to common organizing and bargaining standards where there are overlapping workforces, industries and employers. c) Immigration Reform and Legalization: Campaigning for legalization helps win ongoing campaigns to organize immigrant workers, builds community coalitions and ultimately will enfranchise millions of new citizens. d) Launching a national campaign to punish anti-worker corporations: Unions won’t succeed unless corporations can be forced not to interfere when workers try to organize. There needs to be a campaign that puts the spotlight on a number of prominent companies with anti-worker practices ranging from interfering with workers’ right to choose a union, to their policies that impoverish workers. The goal is not just to embarrass them but also to demonstrate that unions can punish them, cost them money and that it is bad for business to interfere with workers who are trying to win better lives. Challenging unions to endorse the new set of principles: At every opportunity leaders of unions need to be challenged to endorse this new set of principles designed to build strength for workers. It isn’t enough to campaign inside the labor movement. Building a new labor movement requires leading a national campaign that unites workers and their allies. Lead a national campaign with an overarching moral theme. In the 1880’s labor led a movement for the eight hour day arguing that winning a shorter work day was essential to having a just society. On a local and national level workers and their allies organized, struck and ultimately won the eight hour day. Labor needs a campaign that defines what we stand for and isolates those who oppose us. A campaign that excites and mobilizes members of unions resonates with non-union workers and captures the imagination of the country. Leading a campaign calling for a guarantee of health insurance for everybody that works offers such an opportunity. You don't need to be a visionary to see the future for workers if we don't change and rebuild our movement. It is too easy to convince ourselves that our local, our union, our city, can somehow ride out the tidal wave of hypercompetition and deunionization that is sweeping our country and the world. We don't have to imagine the consequence of inaction, we have a window to look into the future of a country and world where workers don’t have power. A window that lets us look at how US corporations abuse workers and the environment in Mexico now. A window that lets us look at how public sector workers are paid in states where private sector unions and labor’s political power barely exist. A window that lets us look at giant service firms that are union with high wages in Scandinavia and non-union with poverty wages here in the US. We know what the future is if we don't act- we can change the future and the world if we do. Steve Early: A Look at Three "Strategic Campaigns"
Lenny Gentle: South Africa's Experience of "One Industry, One Union"